Bearings are a common machine element that is designed to reduce the friction between moving parts and constrain motion to only the desired motion. 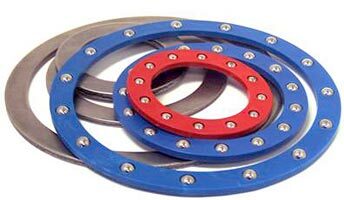 Ball bearings and roller bearings reduce sliding friction by using balls within the outer and inner ring of the bearing. Because the purpose of a bearing is to prevent friction, it is important that the construction materials of the bearing are strong enough to withstand the constant motion and friction of their operating conditions. Two common construction materials are carbon steel and stainless steel. Both carbon steel and stainless steel offer users a high strength to wear ratio. This is essential for long service life and efficient operation. Both our carbon and stainless steel options are surrounded by a nylon retainer, which offers a host of advantages as well. So, what is the difference between carbon and stainless steel? The definition of carbon steel can be a bit vague. One definition of carbon steel is simply steel that is not stainless steel. Typically, carbon steel has a carbon content up to 2.1% by weight. As the percentage of carbon increases, when heat treated the steel can become harder and stronger, but less ductile. As the carbon content increases, it also reduces the weldability and lowers the melting point. Stainless steel is steel with a minimum of 10.5% chromium content by mass. The main feature of stainless steel is its resistance to rust, staining, and corrosion. In contrast, carbon steel that is unprotected can easily rust when exposed to air and moisture. Since the greatest difference between stainless steel and carbon steel is their resistance to rust and corrosion (due to the chromium content of stainless steel), it is often the case that stainless steel is the ideal construction material for corrosive environments. Applications with exposure to air, corrosive substances, or water often benefit from the natural corrosion resistance of stainless steel. Our stainless steel bearings and washers and our carbon steel bearings and washers both combine the cost-saving, lightweight benefits of a nylon retainer with the high strength and wear ratio of stainless steel or carbon steel bearings and hardened thrust washers. Contact us today to learn more about our complete line of bearings! This post was published on October 4, 2017 and updated on April 9, 2019.